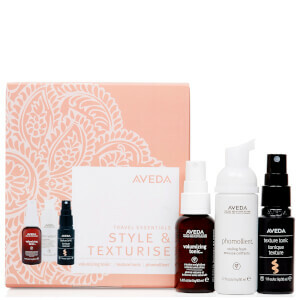 Achieve salon-worthy results on-the-go with the Styling Discovery Set from Aveda. Housed in a branded box, the kit combines three travel essentials that will allow you to create voluminous, full-bodied styles with a long-lasting finish. Ideal for fine to medium hair types, the weightless formula creates maximum volume and delivers unbeatable body. Combining Certified Organic Aloe and Wheat Amino Acids, the non-greasy tonic adds lift at the root for ultimate, lasting definition. Imparts the brand's signature aroma of Jasmine, Rose and Clove. Suitable for use on both wet and dry hair, the texturising spritz combines a unique balance of ingredients to enhance texture and hold. Epsom Salts add raw grip, whilst Cane Sugar hydrates and softens to leave hair touchably supple, never crunchy or dry. Providing flexible hold, the solution will help create effortless bed-head and undone styles, or beachy, tousled waves. Volumizing Tonic: Spray on damp hair. For maximum volume, apply at roots. Texture Tonic: Spritz from mid-lengths to ends and scrunch in to open the curl and for a raw, natural, tousled look. 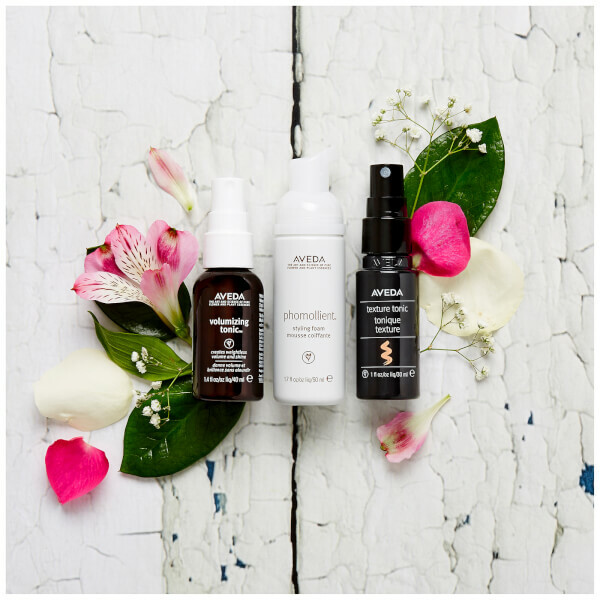 Volumizing Tonic: Aqueous (Water\Aqua\Eau) Extracts, Lavandula Angustifolia (Lavender) Flower Extract, Echinacea Purpurea (Coneflower) Extract, Aloe Barbadensis Leaf Juice, Vp/ Dimethylaminoethylmethacrylate Copolymer, Alcohol Denat., Panthenol, Wheat Amino Acids, Oryzanol, Tocopherol, PEG-40 Hydrogenated Castor Oil, Cetrimonium Chloride, Maltodextrin, Fragrance (Parfum), Eugenol, Linalool, Hydroxycitronellal, Phenoxyethanol. Texture Tonic: Water\Aqua\Eau, Magnesium Sulfate, PVP, Propanediol, Polysorbate 20, Saccharum Officinarum (Sugar Cane) Extract\Extrait De Canne A Sucre, Pullulan, Sucrose, Babassuamidopropyl Betaine, Glycerin, Sodium Chloride, Citric Acid, Fragrance (Parfum), Farnesol, Eugenol, Linalool, Citronellol, Limonene, Benzyl Benzoate, Cinnamal, Geraniol, Cinnamyl Alcohol, Potassium Sorbate, Phenoxyethanol.